2 Cut into quarters if large, or halves if small. 4 Squeeze the juice from the lemon. 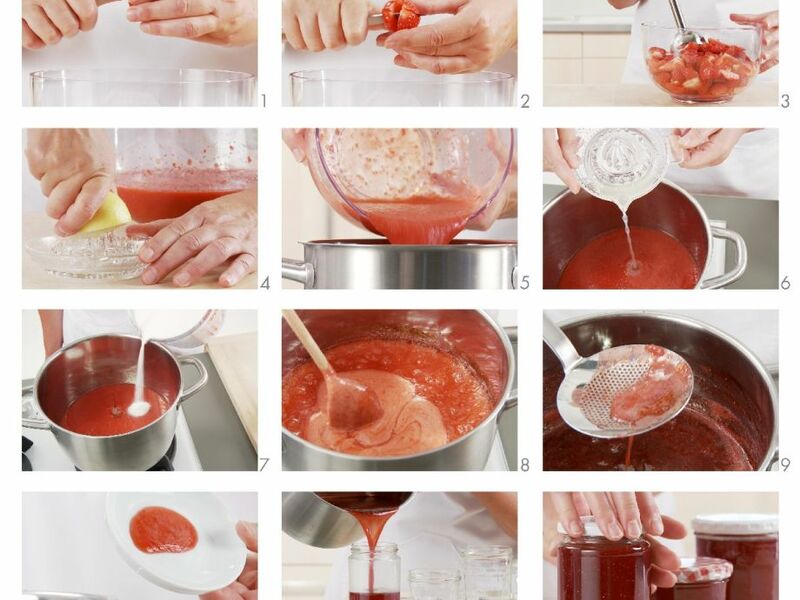 5 Tip the strawberry puree into a large heavy-based pan. 6 Add the lemon juice and stir to combine. 8 Heat very gently, stirring from time to time, until the sugar has dissolved. 9 Increase the heat and bring to a boil. Skim off any scum that rises to the surface. 10 Boil rapidly without stirring for 8-15 minutes. Test to see if setting point has been reached. If not boil for a little longer. To tell when setting point has been reached, remove the pan from the heat and put a little jam on a chilled saucer. As it cools, the jam will begin to set and will wrinkle slightly when you draw your finger through it. If using a sugar thermometer it will read 105°C|220F. 11 Pour into warm sterilised jars and cover the surface of the jam with waxed circles. Wipe the outside of the filled jars. 12 Seal tightly with lids or transparent covers and elastic bands. This must be done while the jam is hot not warm, to prevent mould forming. Seal tightly.